I firmly believe that people are what makes a house a home. Any house can provide four walls and shelter, but until you put people in it who love, laugh, and live there, it is simply that- a shelter. We want this house to be a home. Not just for us, but for all who walk through our doors, whether for just a few minutes or for days. We want people to feel welcome and loved. Because they are! Aside from a few boxes in the library/office and the garage (let's not talk about that yet) we are unpacked and settled! And we have a calendar packed with names of people coming to visit already. It is so exciting. There are rooms ready and plenty of space and it makes me grin from ear to ear. So for a quick tour- minus the library which is still a work in progress and will get its own post and the boys room, well, because...boys! I tried to take the after picture from the same viewpoint as our before, but bear with me regardless- I do not claim to be a photographer. This is the Master Bedroom. It is on the main floor, which makes me very happy. I was going to get rid of the yellow paint, but it is growing on me so it may stay for a while. This is the view from our kitchen eat in area to the living room. The chandelier is lovely, but not our style so we will try to sell it and replace it at some point. It's on the to-do list! If you are sitting on the leather couch, this would be your view with the kitchen to the right. This is our basement family room. Currently on Sundays, it is filled with young adults having coffee, sharing food, playing games, and lots of laughter. Makes my heart so happy that they feel welcome here. And the view from sitting on the couches. On the top floor is the boys' loft- also where their bedrooms are. We pray it will be a great space for pre-teen and teen gatherings as well. The couch is also a pull out bed for kids to use. Just a quick kitchen view. The jury is still out as to how I feel about open cabinets. In theory, I love them, but I am not convinced the visual clutter won't get to me in a few months. Time will tell. Yes, our hall bath was lavender. Not sure why as it did not go with anything else in the house, but Ashton fixed it quickly for me and a sweet friend gave us the mirror! The dining room- also where the boys and I do some school, so yes, the sideboard is full of current school supplies and curriculum. Our new family mantra is LOVE GOD, LOVE PEOPLE! (I need a sign, Jennisa!) Pray for us to do that well! And make your reservation soon! ;) Your room is waiting. So is the front porch! The last time I did a review for By the Way, it was for their book on Florida. It was a perfect fit for this east coast family who lived in Florida for several years. We are back to the By the Way Book Series and this time around we got to review New York City- By the Way. Pretty perfect since we have a NYC loving daughter who has gone twice and will try to get anyone she knows to go with her again. Ironically she is at school finishing up her senior year, so her youngest brother, age 11, and I have gotten to read this cool book before her- shhhh, don't tell! The By the Way book series has an ever growing title collection including Ireland, Alaska, Indiana, Colorado and more. These books are indeed a story, following Alex and Lexi on an adventure to a specific location, but they are also so much more. Each book is packed full with information; the newest ones even more so than before. Inside each hardback book you will find geography, history, science and more. Each page has engaging color pictures to hold the interest of younger children, but the facts you will learn are perfect for your whole family. Within each book, written by author Joy Budensiek, is the intent to teach kids about God and His world and His truth. "Discovering Biblical Truth in Everyday Life"
Scripture is quoted often, but in a natural, conversational way. It is way to present a Christian worldview and open up conversations with your children about God in a relaxing, non-threatening environment. New York City- By the Way is a 48 page book of fun! Alex and Lexi are joined by their classmates on a three day trip to New York City with their teachers. Each day is packed with activities where they learn that, despite being in a busy city, they can still see evidences of God in nature. While exploring they see many animals including squirrels, ducks, and pigeons. They also learn about turtles, coyotes. and butterflies. When trivia is mentioned throughout the book you will often find side boxes with facts about that specific thing. Consider it a mini encyclopedia lesson! Also included in the New York book is a whole lot of geography and history. As the class travels to all 5 of the city's boroughs, they learn about the 175 zip codes that are there and check off as many as they can find as they explore. They also learn about the history of each area and other neat facts. Like usual, Colby (6th grade) grabbed this book and read it before I had a chance to. This is NOT a one sitting book! It is more like a chapter book, but without the chapters. I think he read it over the course of a few days and he is a pretty voracious reader. If you are using it as a read aloud, I recommend you take it in chunks- there is so much to absorb and talk about. Of course, this list is just the tip of the iceberg! I told you these books were a wealth of information! So my favorite part- hard to choose! I loved reading about some of the older history of the city, especially about the immigrants who came by way of Ellis Island. Did you know that in one single day in 1907, almost 12,000 immigrants were processed. That absolutely amazes me. Another thing that blew my mind- there are 138 languages spoken in Queens alone! Can you just imagine what it would be like to hear even just a fraction of them all at once? No wonder the city is so loud! Colby LOVED ready about Winkie! She is actually a pigeon, one of 32, that was awarded the Dickin Medal for serving in WWII. When the ship she was on went down in the North Sea, Winkie flew 120 miles back to her owner and is credited for saving the lives of all the men on the ship. He was also shocked to learn that there are 5.2 million trees in NYC, with 592,130 on city streets. Like he said... "who knew?" There is also a fun picture search where you find 10 pictures hidden throughout the book to entertain and challenge your younger kids. It might be a way to help keep them engaged if the story gets a bit long for them. Whether you are a unit study kind of mom, a history and geography fact kid, or just looking to add beautifully illustrated books that teach God's word, you will love this By The Way book series! The only problem- choosing which one to start with! Who Doesn't Need to be Rescued? The Captain Sun Adventures has a new book out called Rescue Me! What Superheroes Can Teach Us About the Power of Faith, by Bryce Morgan and we have had the opportunity to review it these past few weeks. This 34 page, paperback book is part comic book/graphic novel and part kids' devotional. It is written at a middle school level, but can be used as a fun read aloud for a family or in a Sunday school group situation. With eight chapters of full color pictures, Rescue Me! will keep the interest of your most reluctant reader. Comic books just seem to do that, don't they? Rescue Me! introduces a superhero named Captain Sun who is searching for the recent darkness in his city. Enter Black-Out, the evil villain who has come to "snuff out the light." What follows is a battle of good and evil where ultimately (spoiler alert) good wins out in an unexpected way. What makes this book different from your average comic book is the fact that it is much like an allegory of our ultimate hero- Jesus. "So have fun with Captain Sun, but have faith in the Hero of Heroes: Jesus." Following each chapter is a "study page" written as if from a newspaper. There you will find a lesson tied to the chapter just read, slowly outlining the central themes of faith in Christ in simple terms that a younger child can understand. On each lesson page you will also find a question to get their mind active. For example- If you could have one super power, what would it be? Why? Each lesson also ends with a scripture verse and reference. At the end of the book you will also find "questions to think about", two for each chapter. How we used this and what did we think? As usual, as soon as this book hit our mailbox my son, age 11, (6th grade) took off with it. This kiddo loves books, but his new favorite thing is definitely graphic novels. Honestly, he read it in about 30 minutes! He did admit he skipped the lesson pages the first time through because he wanted to see what happened in the end, but I did convince him to go back and read it a second time, slowing down enough to take in the lesson pages. We have since gone back again and talked about what he read in each chapter and the discussed the questions together. It was interesting to see what details he picked upon and those he did not. I also imagine this would be a fun book to use with a group, reading a chapter a week, and then using the questions as a spring board to some great discussion. One of my favorite chapters is Chapter 4 when POWER is discussed. In the lesson, Bryce talks to kids about how God has given us power as well- the power to love and obey God. It's not power that simple comes from imagination, but from a God whom loves us. What a great truth for kids! I also love that this book stops after each chapter with a lesson, allowing a child to slow down with their reading and absorb what they are learning. The questions are a great way to help a parent engage their children in a conversation, which, let's face it, is often a challenge with kids this age. Colby's favorite parts, of course, are the battles! BOYS! He did also say he liked how Captain Sun taught not to fear darkness because Jesus was our light. Hearing that thrilled this momma's heart as fear is something my son has struggled with in the past. It is great to have books that entertain children, but how much better is it when those books teach them as well? I can think of no other lesson I would want my child to learn than they are loved by God! Such a sweet life lesson from Rescue Me! What Superheroes Can Teach Us About the Power of Faith. We are not really a television watching family, but boy, do we love our movies! That is why there is always a lot of excitement around here when we get the privilege to watch and review a movie before it is released to the general public. Such is the case with Unbroken. We got to watch a special screening last month and I have been trying to wait patiently to let you all know about it. Well, today's the day I get to talk about it, as it will be coming to theaters in a few days! 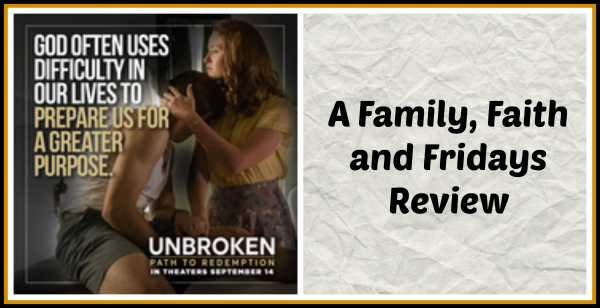 In case you are not familiar with the title, Unbroken, Path to Redemption is the sequel to the original movie made a few years ago titled Unbroken. Both are based off the best selling book by Laura Hillenbrand based on the true story of Louis Zamperini, and the second movie picks up where the first left off. 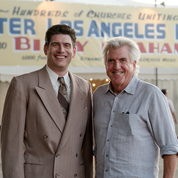 The story is about Louis Zamperini, an Olympian and World War II hero. After Zamboni's plane was shot down and he was found by the enemy after floating on a raft for days, he become a prisoner of war for years before returning home to California. That is where this movie now picks up. While he seemed "unbroken" to those around him, Zamperini's life begins to fall apart due to post traumatic stress disorder. Even after marriage and a job helping the government sell war bonds on a traveling tour, Zamperini turn to alcohol and becomes increasingly more violent and unpredictable. 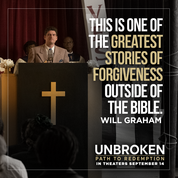 The story follows his life, the conversion of his wife Cynthia at a Billy Graham rally, and ultimately the path of healing and salvation Zamperini finds. Zamperini and Billy Graham became friends and worked together for several years. It is also a powerful story of forgiveness as he learns to forgive the very people who tortured him while he was a POW. It took a little convincing on my part to get my family to watch this movie. While several had read the book, none of us had seen the first movie, and my daughter in particular was much concerned about this sequel being made by a different crew and starring different actors. She was afraid that, even if you had not watched the first one, it would somehow seem disjointed. I would have to say that was not our experience! 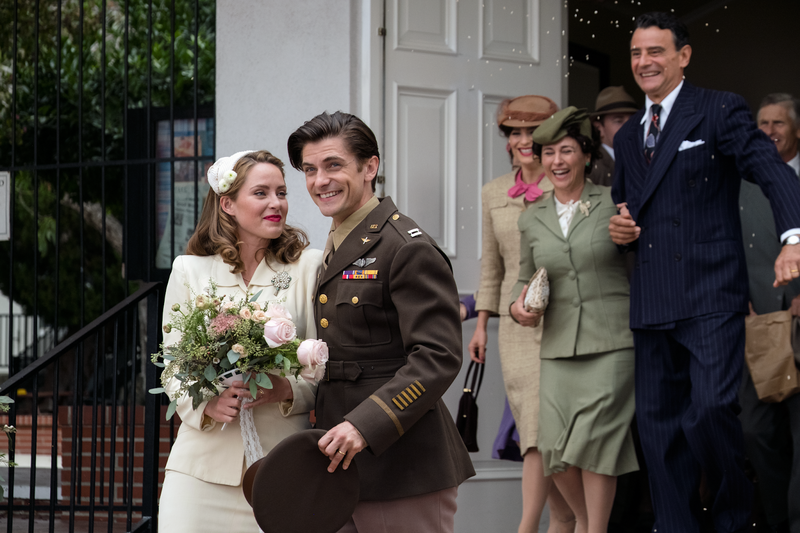 Again, having not seen the original Unbroken, I feel the film crew did a good job with flashbacks and such to catch you up to speed with where the story was being picked up. The acting was strong and the story line is powerful. There are some pretty intense flashbacks as well as some slightly violent scenes when Zamperini is drunk, but I am particularly sensitive to both of those things. I would not recommend this film for younger audiences- it does have a PG-13 rating. While a Christian movie about grace and redemption, this is not one of those movies that forces "religion" down your throat. It is however a movie that shows our need for Jesus and shows how stress and trauma can affect every area of your life. All and all, it is a good movie and one I think you will enjoy. I have TWO FANDANGO ticket codes to give away! Just leave me a quick comment of why you would like to see this movie and make sure I have a good way to get a hold of you if you are the winner. We will draw a random name on Monday! Bible Biography Series for Kids! I often get to review some pretty neat stuff, but this REVIEW has been an extra blessing for us. Barbour Publishing has a series called the Kingdom Files Series, currently with six books, geared for ages 8-12. We were given Who Was Jonah? and Who Was Mary, Mother of Jesus? to take a look at. 1. Fact file- which tells the character's name, where they were from, what they did for a living, what they did in the Kingdom of God, and more. Timelines are also included in this section. 2. Action File- This is the Biblical account told in a child friendly way. While the story is written as a narrative, story fashion, the author does not veer off the storyline original to the Bible. Occasionally things are worded with "might have..." or "maybe..." but more often direct words from the Bible are used and then cited immediately. Sprinkled throughout the story you will find text boxes labeled "clues." These are little tidbits of information to further explain what is happening or give deeper insight. 3. Power up- This final section is the lesson portion of the book. It takes what the child has learned from the story and helps them apply it to their life. Examples from the Who Was Mary book include "Let your life glorify God" and "God is mighty and carries your burdens." There is a Bible memory verse attached to each Power -Up for your child to hide in their heart. There are 10 Power -Ups for each book. So as soon as these two books arrived, Colby, age 11, announced he was reading the Mary one first so I allowed him to do just that. He squirreled it away in his room and read it over the course of a few days, brought it to me, proclaimed "That was great!" and wanted to know if he could read Who Was Esther next. Note, that is not one we currently own, of course. I decided to read Who Was Jonah? on my own before he could get his hands on it. The boy is a book thief and there is always a small possibility he will run off with a book he likes and I won't see it for a while! Jonah has always been one of my favorite accounts in the Bible. Who out there wouldn't be able identify with the prophet who tried to run away from God when asked to do a hard thing!? How often I want to choose to run away rather than obey and do what God is calling me to do. Power-Up #2 for Who Was Jonah is "don't be afraid." What a great truth to teach our kids...and ourselves! So, what did I think? I really like these little books. They are packed full of information and I love how they are written. As you read you will feel that the author, Matt Koceich, is telling you the story, speaking directly to you, often interjecting his thoughts and ideas as little aside. It is very conversational in tone, which I think often holds young readers' attention. I love that these can be used as "just" a book on the shelf for your middle school kiddos. Let's face it, there is a lot of inferior reading material out there and I like knowing that the books at my kids' fingertips are quality literature. Since Bible Biographies are not often written for this level, these books fill a unique niche. I would also recommend you use these books for Bible time with your kids as a family. I imagine you could read the story together over the course of a few days in read aloud time. I would then use each Power-Up point as a point of study, one each day or even one each week if you want to commit the verse to memory. We have done scripture memory work often in our home, the kids are ALWAYS better at it than I am, and it always blesses us! The Kingdom series could also be used as a classroom study such as Sunday School or small group settings for 8-12 year old. No matter how you choose to use The Kingdom Files Series from Barbour Publishing, I know you will be blessed to add them to your bookshelves. God's Word and the lessons it teaches us about the God who loves us is always worth the read! 101 Doodle Definitions is a Hit!